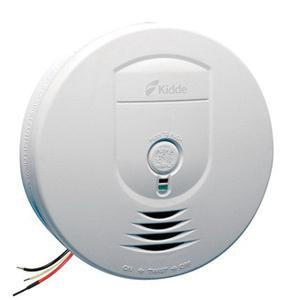 Kidde Wireless interconnect smoke alarm ensures maximum detection of the various types of fire that can occur within the home. Alarm in white color, measures 5.75-Inch Dia x 1.25-Inch. Alarm featuring piezoelectric horn, has noise level of 85 DB at 10 ft. It incorporates ionization smoke sensor that is effective at detecting particles produced by flaming fires. It employs wireless technology that uses radio frequency to both transmit and receive messages about a hazard in the home. Alarm supports interconnection with up to 24 Kidde devices of which 18 can be initiating. This alarm has LED light that flashes for indicating power receiving status. It employs Hush™ feature that temporarily silences nuisance alarms. This AC hardwired alarm has 9-Volt battery backup for providing power during power outages. It has low battery indicator that chirps when battery needs replacement. It supports mounting on wall and ceiling for making installation easier. It withstands temperature of 40 to 100 deg F. Alarm is UL listed and meets NFPA standards.